Analyzing the Korean Peninsula’s contemporary engagement with the Persian Gulf region from the 1950s to the present day, the book begins by asking the following question: What drew Koreans to the region in the first place and under what circumstances were they drawn there? 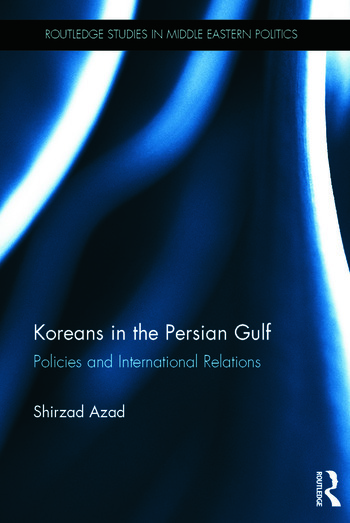 While taking into account a combination of both external and internal factors shaping the dynamics of the Korean Peninsula’s interactions with the Persian Gulf region, this book largely concentrates on the agency factor to analyze the nature and scope of a rather multifaceted relationship between the two areas. The Republic of Korea has, in fact, maintained diverse connections to every single country in the Persian Gulf over the past several decades, and its rather considerable activities and accomplishments in the region all justify such an overwhelming focus. The Democratic People’s Republic of Korea’s record in the Persian Gulf, however, is mostly limited to its relationship with Iran, though Pyongyang has pursued relationships with some other states in the region. This book studies the elements of Pyongyang’s actions in the region as an appendage to South Korea’s various political and economic achievements. Employing a process-tracing approach, this book will be of interest to policymakers, as well as to students and scholars of International Relations, Middle East Studies and Asian Studies. Shirzad Azad is a visiting scholar at Seoul National University’s Department of Political Science and International Relations.